People tell us restaurant reviewers that we have the best job in the world. The truth is: it’s not that easy. We’ve all read the reviews breathlessly declaring “OMG! This place is SOOOOO good!” But a thoughtfully-crafted restaurant review is so much more than just grabbing a quick bite and deciding publicly whether you like it or not. It can be difficult to put a sensory experience like eating into words; it can be even more difficult to convey the emotion behind the words without resorting to emoticons and exclamation points. 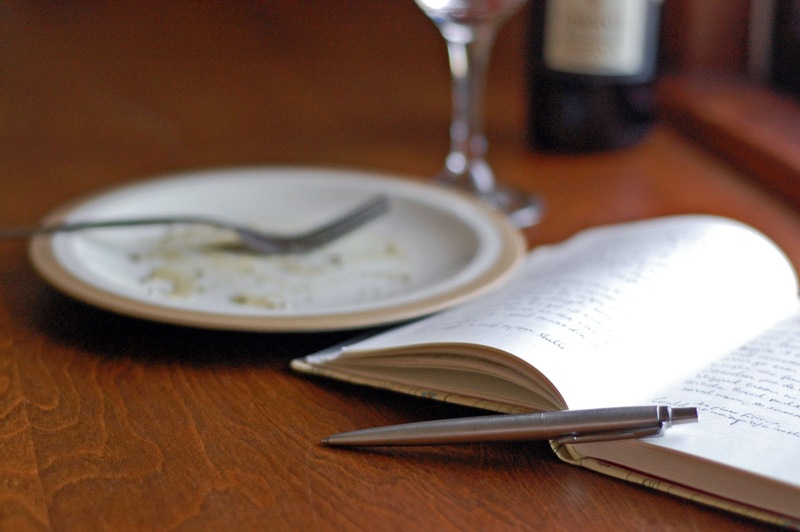 Here I offer some tips on restaurant reviewing—in the first part, your experience at the restaurant, and secondly, the actual putting of pen to paper—that I hope will open a dialogue on this forum about reviewing, and give you a starting block for fabulous, witty reviews. The Devil is in the Details. First, give us plenty of details about the atmosphere. What kind of a place is this—jeans and sandals, or coat and tie? Beware of clichés; “charming little bistro” and “hole-in-the-wall” are so tired. Give them a rest and show us instead what made it so charming to you—maybe the little pink menus and the bud vase with a single daisy on each wrought-iron table? That said, be concise. In my opinion, the ideal length for an in-depth review is around 500 words, or one double-spaced page. Any longer and your readers may lose interest; any shorter and the details may not be properly fleshed out. If you find yourself too loquacious, here’s a tip: unless you expected something of a much higher caliber, cut out any “average” parts of your experience. “The service was average” is not a meaningful sentence. We don’t care about average; we want to know what you recommend and what we should avoid. Tone it Up… or Down. Robert Nadeau’s seething review of Todd English’s Bonfire, printed in the Boston Phoenix in 2002, is a great example of a review with a particular tone. In this case, it’s anger. Note the short, matter-of-fact sentences, so out of character for Mr. Nadeau, and the incredulous questions (“How has he arrived at a situation where he cannot organize a kitchen in downtown Boston to serve a proper $48 steak?”). Anger may not be the best choice for your review; in fact, it probably isn’t. But the point here is to be aware that your word choices and sentence structure will set the tone for the piece. Notice how your words work together and how the piece sounds as a whole. Read the piece out loud to yourself, or ask a friend to read it over. The Good, the Bad, and the Ugly. Here’s the truth: a well-written bad review is, and should be, astronomically more difficult to compose than a well-written good review. Sure, it’s easy to harpoon a restaurant when you pay too much for mediocre food. But resist the temptation. The key here is balance—when doling out criticism, we need to strive for fairness and courtesy, and work hard to mention the good bits. If the waiter who brought you your rubbery chicken dish was attentive, be sure to let people know. Even in his review of Bonfire, Robert Nadeau did his best to point out the good parts of the meal. Carey also notes that “for all its faults, Delicatessen has judged its market well.” Meaning: he himself hated the place, but he is not the restaurant’s intended patron. Restaurants, like all businesses, aim to establish an image and then service one or a few market segments. Bennigan’s has its football enthusiasts and families with picky children eaters, just like L’Espalier has its businessmen and romantic couples. Even if you make your negative opinions known, there is value in a review that acknowledges that maybe it just wasn’t your scene—but other diners could enjoy eating there. Try to pinpoint the restaurant’s intended message (Irish gastropub? Upscale comfort food? Classic French?) and judge the restaurant on what it is, not what you think it should be. Please join me now for a collective “huh?” The lack of detail (and substance, really) coupled with the vague descriptors makes this review dubious at best. How exactly was the service rude? What did the interior look like? And—most importantly—what did the food actually taste like? Now, I’ve never eaten at a Plato Loco, but it seems like a menu offering “very traditional Mexican meals” could have something unique to offer. In his haste to slap the label of “poor” on poor old Plato Loco, Mr. Moore may have entirely missed the point of the restaurant, and judged it on what he wanted it to be (Taco Bell, it sounds like?). Beware of reviews like this, without any descriptors or evidence; your readers will begin to distrust and lose respect for your opinions. The Pen is Mightier. Your review may have an effect on someone’s livelihood. Let me say that again: your review may have an effect on someone’s livelihood. In the age of the internet, it is entirely possible that even an amateur review can reach a good deal of people, and have a substantial effect on a new restaurant or a small restaurant. Perhaps this what Noah Ellis had in mind when he ousted the LA Times critic from his establishment, a desperate move to prevent his business from suffering at the pen of a critic before it could get off the ground. This is not a time for careless words. Write responsibly. If you write a negative review, you need to know exactly what you’re doing. It takes a careful eye and a prepared mind to write a useful restaurant review. I’d like to hear from all of you who have thoughts on the matter—do you agree with my suggestions? Disagree? Do you do things differently when you write your own reviews, or have your own tips to share? I’m open to dialogue and, as I wrote earlier, I hope this will give you a starting block for fabulous, witty reviews.